As the days shorten and autumn arrives, it’s time to start considering holiday gift items, or even a couple of household goodies you might just want to keep for yourself. Take, for example, the remotely controllable slow cooker from WeMo, which lets you check on your meal in progress without actually having to be in the kitchen. Quickly and easily adjust your device’s temperature and cook time via the WeMo smartphone app, or just turn it on or off completely while you’re away. Plus, its six-quart oval stoneware cooking chamber is removable and dishwasher-safe. Forget fall foliage and Indian corn—add some festive color to any of your home’s doorways with a natural or faux berry fall wreath. 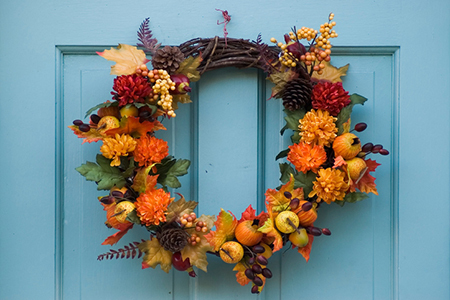 Many retail and online home stores and garden centers are offering stemmed bittersweet wreaths gleaming with russet red and persimmon, instead of autumn’s more understated browns and oranges. Or, add rustic charm to any abode with small-scale set of burnished-bronze Anthropologie Airen antlers (Anthropologie.com, $21). Their hefty aluminum build is sturdy enough for holding purses and scarves by the door, or can just as easily be displayed in the living or bedroom as cruelty-free, cabin-inspired wall art. Match them up with a pair of Pier 1 Imports antler-shaped candle stands ($28 each). Substitute in lieu of a traditional cornucopia to open up the visual space, while giving any tabletop or nook a more dramatic feel. If you’re not ready to panel an entire room, or looking to add a few natural woody accents, try Target.com for one or more sets of decorative Weathered brand wood panels. Their eye-catching geometric design is described as the perfect home decor for the minimalist household. Or if you want the easy-to-apply—and remove—effect of wood, JCPenny.com offers extremely authentic-looking and American-made Beachwood Peel-and-Stick Wallpaper. Use it to freshen up a backsplash, as intriguing shelf-backing, to accent small areas, or on an entire wall.